As we start a new year, we have yet another new poll about how Canadians are once again listing paying down debt as their top financial priority for 2017. This survey, from the CIBC, says that for the seventh straight year concerns about debt were a top concern for most Canadians. As we start a new year, we have yet another new poll about how Canadians are once again listing paying down debt as their top financial priority for 2017. This survey, from the CIBC, says that for the seventh straight year concerns about debt were a top concern for most Canadians. In fact, almost three in ten Canadians said that paying down debt was their top financial goal -- the highest since 2010. This isn't surprising given the astronomical rise in mortgage and consumer debt levels that continued in 2016. Household debt once again hit record levels in 2016, and the trend of increasing debt is certain to continue in 2017. Canadians are living paycheque to paycheque, with our debt repayments consuming a significant amount of our cash flow. The pressure to make ends meet are likely to increase, not decrease. One study by Dalhousie University found that food prices are expected to rise an average of three to five per cent in 2017. Another report by the Canadian Centre for Policy Alternatives highlighted the increasing cost of child care for families across Canada. And as many in Alberta, Manitoba, Saskatchewan and Newfoundland and Labrador found out this past year, a booming economy can turn on a dime making it hard to repay what seemed like affordable debt. The result was a 34 per cent increase in consumer insolvencies for these four oil-economy provinces over the past year. In my experience, no-one expects that they will be caught in the trap of being overextended by their own debt. When you realize you have too much debt, you don't necessarily know where or how to make a change that will see your risk level fall. The same CIBC study found that almost 30 per cent of Canadians took on more debt in 2016 -- and a third of those did so because they couldn't keep up with their daily living expenses without turning to more debt. So once again, my New Year's outlook is pessimistic and yours should be too. When someone asks me how anyone can accumulate $20,000 worth of credit card debt, my response is "it's easy." Most of our clients didn't incur that debt overnight -- it happens over time. If you add just $250 a month in charges to a credit card with an opening balance of $2,000, and make all your minimum payments, your credit card balance will balloon to $20,000 in just over seven years. As rent or mortgage payments increase, food costs go up, and day care costs grow, so it's no wonder that for some many people, credit cards become the go-to source to balance the budget. Homeowners may be enchanted with the rapid rise in the value of their home, which in places like Toronto is more than likely outstripping their growth in household debt. However, another study by Manulife this past year found that almost half of all homeowners are unprepared for emergency expenses and four in ten have trouble managing their every day expenses. Mortgage rates have already increased slightly, and are likely to do so again in 2017. The same study found that one in six homeowners would find it hard to cover ANY increase in their mortgage payment. Interestingly this is the same rate as the long term rate at which Canadians will file bankruptcy which should be a glaring warning signal that we are in for a fall. So once again, my New Year's outlook is pessimistic and yours should be too. Pessimism, or a little fear, can prompt a change in your behaviour. 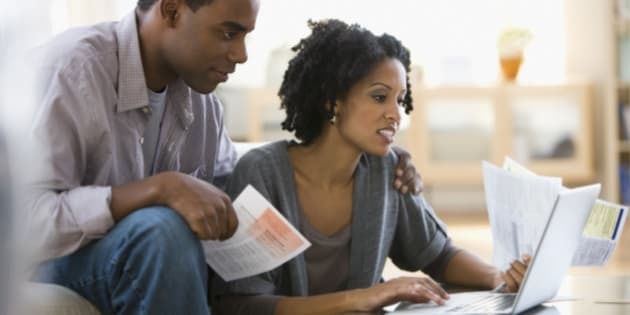 If you are worried about debt today, focus on two things: stop taking on new debt (which means balancing your budget) and talk to an expert on how you can create a plan to reduce the debt you have already. Then maybe, a year from now, you can be optimistic about making savings your top financial goal for 2018.